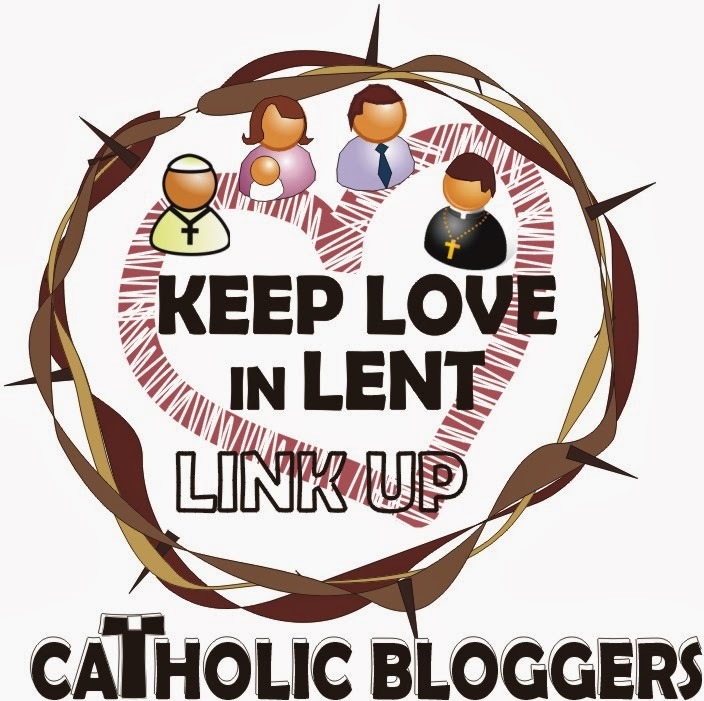 Welcome to one of many blogs participating in the Keep LOVE in Lent Blog Link-up 2014! We will be sharing tips, stories and experiences that will help us focus on Lenten sacrifices, prayer and good deeds, and how to carry them out with LOVE instead of a GRUMBLE. 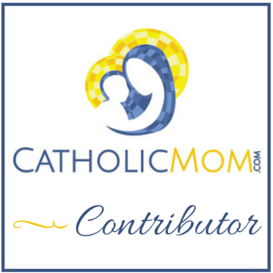 To enjoy more of these wonderful posts, please visit them at Catholic Bloggers Network. God bless, and happy Lent! After writing seven blog posts last week, it has been a little quiet here this week. And rightly so, for yesterday began the holy season of Lent with Ash Wednesday. 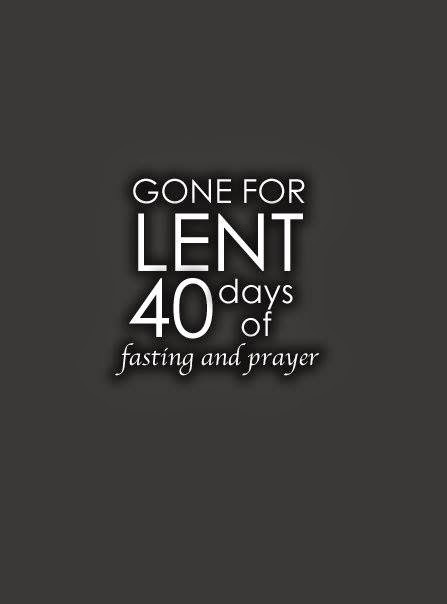 This year, more than any other year, I have been longing for Lent. Maybe it’s because it started so late this year, and therefore the season of prayer and fasting just seems long overdue. But also, as I was preparing for Lent over the past few weeks, I had an epiphany that has helped me welcome this holy time. I recently wrote about my realization that Lent isn’t about what we do but about the spirit in which we do it. It’s not about how many things I can check off a list, how many activities I can do with my children, how perfect I observe my fast, how many prayers I say in a day. It’s not about those things, because if I do those things without love, well, like Scripture says, they are like “a nosy gong or clanging symbol” (1 Corinthians 13:1). So, to keep love in Lent this year, I am looking inward to what Jesus is asking of me. And through much prayer and contemplation, He is asking me specifically to focus on being present to the moment by giving up Facebook and fasting from the computer from 3-8 p.m. everyday. The purpose of this sacrifice is to be present to my family at those crucial hours of the day, so that I can love them better. That is not to say I will spend a ton of time on the computer outside of those hours. My goal really is to be on the computer much, much less. But giving my sacrifice a specific timeframe hopefully will help me form a better computer habit in the long-run. I want this to stick well past Lent! 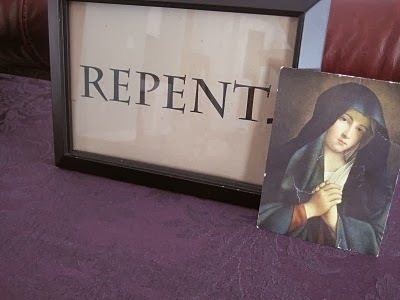 To do this sacrifice with love, I am drawn to be aware of each moment that I think about checking my e-mail or browsing Pinterest and ask, “Jesus, what are you asking of me right now?” And God willing, I will respond faithfully in some small way. This is my heart, as I begin this Lenten journey. This is the way I will strive to keep love in Lent, deep within. My family and I have recommitted to family prayer each night. 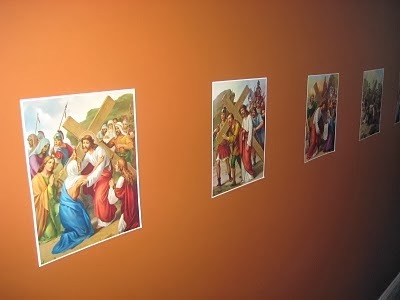 The children attend Stations of the Cross each Friday at school, and I hope to join them or attend in the evening. We also have been known to just pray them at home. We also will pray a family Rosary each Sunday. Sometimes it’s nice just to have a place to pray. As a family, we are fasting from candy and TV. This may not seem very creative to some people, but this is what we need to do, in order to make more room in our hearts for greater love for the Lord. We also will eat very simple suppers during Lent and have a special feast each Sunday. We are going to try this practice as part of our current budgeting process as well as to be in solidarity with the poor. The special feast each Sunday reminds us that Sundays are holy and meant to be set apart from the rest of the week. 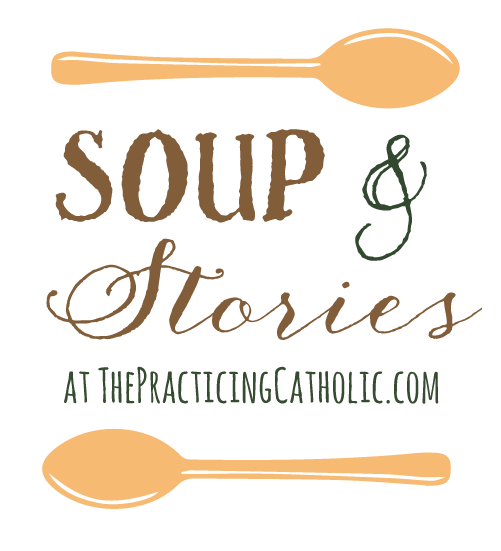 At The Practicing Catholic blog, Lisa is running a Lenten series called Soup and Stories. 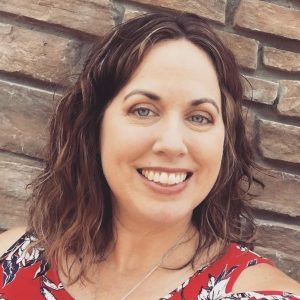 She, along with guest bloggers, will feature different soup recipes and a story behind them, throughout these 40 days. Talk about simple supper! What can be more simple than soup? During Spring Break, one plan that we have is to finally make Blessing Bags for the homeless! There are tons of ideas on Pinterest, which is where the above link will take you. I will work on knitting a prayer shawl for the Prayer Shawl Ministry at my parish. I made a very simple Lenten calendar for my family, and it hangs on our refrigerator. It features our Lenten plans as well as some special activities we have planned for Lent, such as Stations of the Cross on Fridays. There are many beautiful calendars online that are printable or duplicatable. I just made mine in Word, because that’s how much time I had this year! 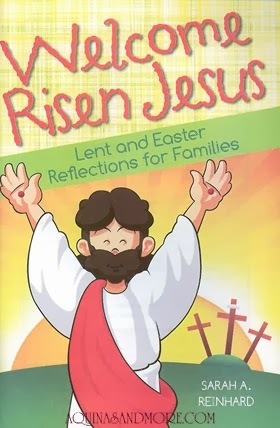 Calendars can be a nice way for children to countdown the days until Easter as well as anticipate special solemnities or feast days during Lent. In the past, I have done an activity with the children called Sacrifice Beans, putting a bean in the jar for little good deeds done throughout the day. On Easter, the beans transform to jelly beans, as a way to visually see what God can do with our little sacrifices. Since we are doing other behavior incentives right now, I don’t think we will use Sacrifice Beans this Lent. But it is a great tradition that I am sure will reappear in the future (or maybe even just for Holy Week)! 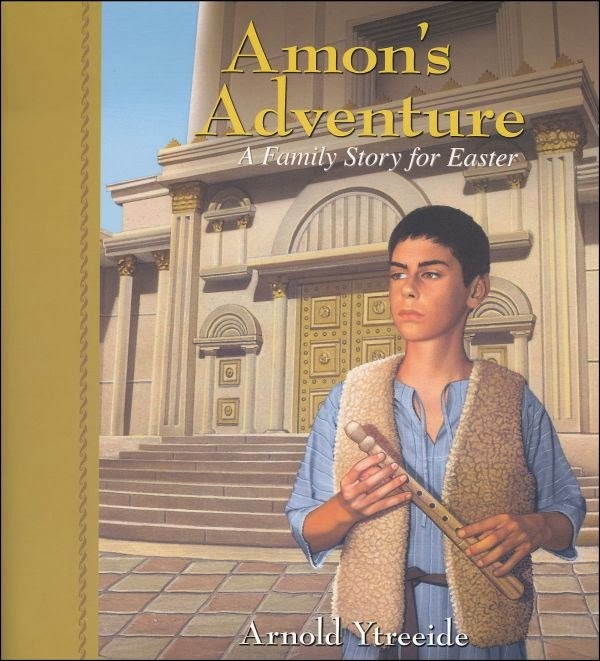 We will read two special books during Lent: Amon’s Adventure and Welcome Risen Jesus: Lent and Easter Reflections for Families, as well as favorite picture books. My spiritual reading will include Finding True Happiness by Fulton Sheen and The Long Loneliness by Dorothy Day (for Well-Read Mom). Lent really is a season of joy! Joy? Yes, joy! It is a sober joy, an inner joy. But it is indeed joy! God is never outdone in generosity! What little we do this Lent, let us do it with great love! Pick and choose what is doable for you and your family, and focus on that! There are so many amazing ideas out there, but we have to be true to who God created us to be and what He desires from us—no more, no less! So, let us have expectant faith that God will accept our little sacrifices and in return, give us so much more! All praise and glory to Our Lord and Savior, Jesus Christ! I don't know about you, but I am worried about how much I am enjoying NOT being on Facebook! Maybe it was a good sacrifice, lol. Ha! I know what you mean, Amy! It is rather freeing, isn't it?! this post was wonderful Sarah! God bless you guys in a fruitful Lent this year. I too am glad lent is here. I needed it too. "Lent isn't about what we do but about the spirit in which we do it." This so true. This year I am not giving up something but simply trying to be more in tune with the overall spirit in which I do things. Thanks for such nice thoughts to begin Lent with, and a reminder of the challenge. Hi Lynn! I hope your Lent is off to a beautiful start! Meredith, I definitely will keep you posted on the Fulton Sheen book! Did you hear the good news that he is one step closer to sainthood?! Yeah!! Thanks for stopping by, Stephanie, and for offering a kind and encouraging comment! God bless your Lent! I really enjoyed how you keep love in Lent! Thank you for linking up to the Carnival to share your ideas and thoughts! Where do I start on what I love about this post?? 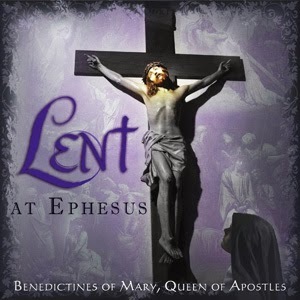 Well, I pinned it on my Lent board and I really like the Lent CD. I'll have to put that on my wish list! Love your Lent calendar too! Perfect for kids! I went to your place to pray link..just lovely! I'm inspired to make something like this in my own home! 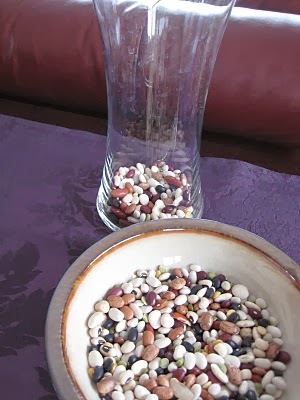 I pinned the Soup and Stories since I'm always looking for good Lent soup recipes. And Blessing Bags for the homeless…what a great way to give alms during Lent and all year! May you have a blessed and fruitful Lent! I'm also giving up 1 hour of my "computer time" and focus more on Him through prayer. 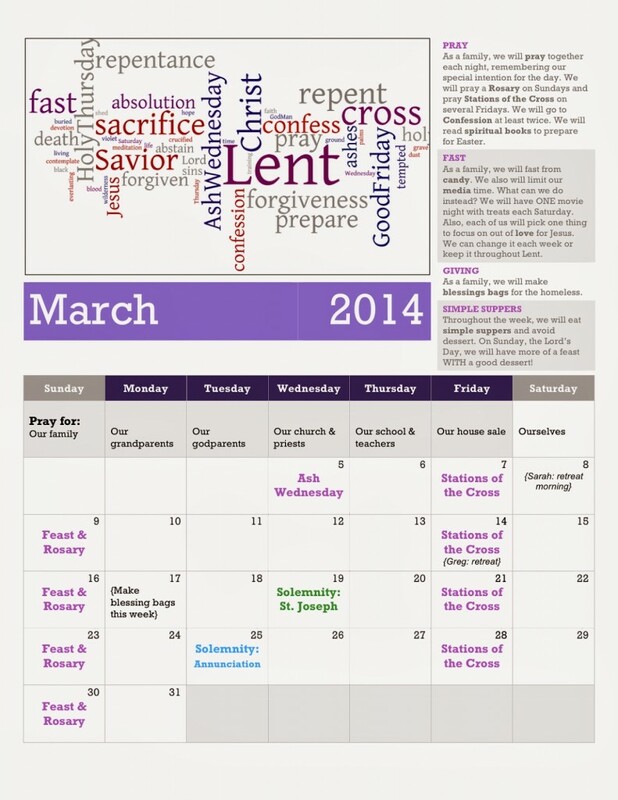 These are all great ideas for Lent. I think that having a set time to be off the computer is a great idea! I think that, in this day and age, being off the computer is sometimes not doable – so having a set time is just perfect. I think I might just try that for me – once I figure out what hours I need to be off, because I homeschool, my kids are home all the time. 😉 Thanks for the idea! Candy and TV is what we're giving up with the kids too. I don't think it's too "simple". My grandmother reminded me that God delights more in obedience than sacrifice. That's really how I've felt this lent to be, to return in prayer to God rather than have a check-list of items to be done (or not done). Hi Tracy! Thanks so much for stopping by! I am glad you liked my post. This was such a wonderful "carnival" to be part of. I have found so many lovely new blogs with beautiful ideas for living out our faith. Just wonderful! Beautiful, Cecille! It is not easy to give up computer time, when it normally is so easy to access. But I hope you find much joy and peace during your extra time with the Lord! God bless your Lent! Hi Peggy! Thanks so much for stopping by! May God bless your Lenten journey! Hi Janice! I agree. We use the computer for so many different things, it is hard to give it up completely. But to fast from it a few hours per day is doable … even for certain days per week or for all of Holy Week. Even something limited like that can be very worthwhile, fruitful and a blessing to you and your family! God bless you during this holy season! Me, too, Ruth Anne! I have felt that way, too! It has been such a blessing, because I tend to be a check-list-type-of-gal 🙂 But this year I am trying to focus more on being faithful in small ways and loving the Lord through my little sacrifices. God bless you and your family this Lent … and always!